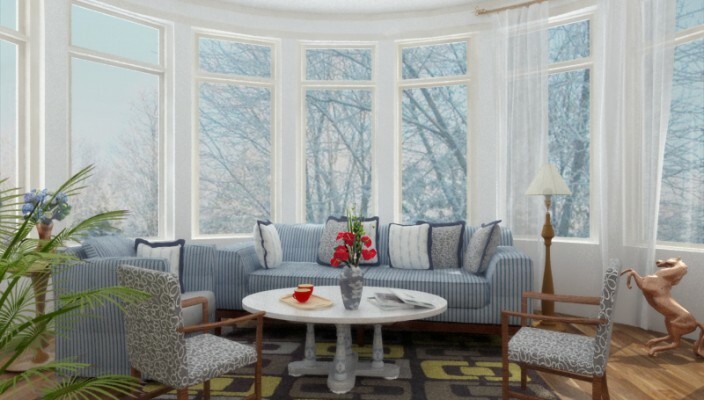 Simple and highly classy living room concept that comes with white walls, long windows and white curtains for matching the furniture in printed style. This simplistic white colored living room is all about style, elegance and a good amount of natural lighting. Bringing the best of furniture in a printed gray and white shade, the design has no unwanted detailing with options to add a few plants on the corners. The large and elongated windows allow ample light to come inside the room, while the white curtains add more calmness and an element of peace to this classy living room idea.